Mullery auctioneers is currently offering for sale a four bedroom detached residence ideally positioned within a small development of eight houses in Inverin. 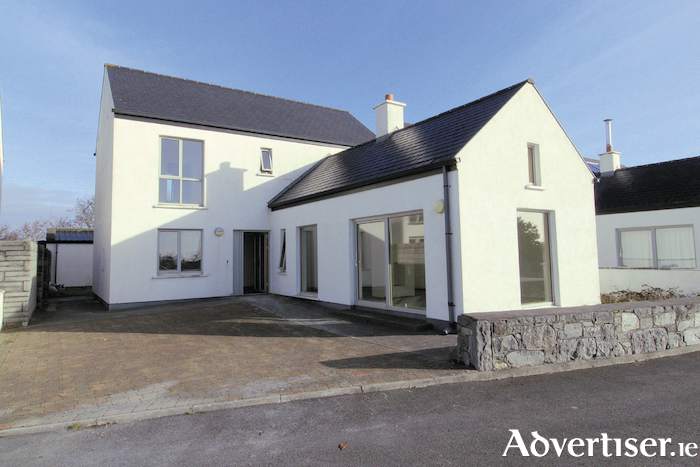 Number 7 Garrai Eoinin boasts stunning views over Galway Bay and the Clare hills. The residence, which is nearing completion, is being finished to a high standard to include underfloor heating, gas fire, high levels of insulation, fitted kitchen, and a mix of wooden and tiled floors. Garrai Eoinin is situated on an elevated site on Bothar Bui, just off the Galway to Carraroe Road, and is within a short walk of local amenities and only minutes’ drive from Spiddal village. The proposed accommodation comprises entrance lobby, hall, living room, kitchen, utility room, bathroom/ shower room, four bedrooms (master en suite ), and shower room. For full details and to view the property, contact Mike Mullery of Mullery auctioneers on 087 6424106 or 091 567275.